This heavy duty, high quality PVC Training Stand is a great choice for training your bird without distractions that usually accompany typical playstands. The materials are the highest quality PVC. 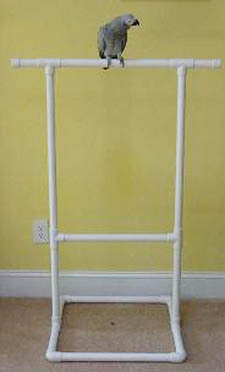 The Training Stand breaks down for easy transport and can be converted to use on a table top. Can be used for training flighted birds. This is the training stand used by Barbara Heidenreich in her Training Seminars. The Training Stand is pictured with a bird to help you judge size. Please select size at Options List. The Training Stand's perch is created for safety and security ... it is scored for your bird's comfort with the manufacturers special texturing process that simulates the feeling and confidence natural wood provides. The perch-scoring process does not create grooves that can harbor bacteria that is almost impossible to remove. This product breaks down so it can be sanitized in your dishwasher. Please Note: This product requires shipping costs to be calculated at the time of shipment. Upon your approval, the shipping cost will be added to your purchase before processing. Details are provided in the Shopping Cart.